I have never liked the smell of synthetic air fresheners. I have a sensitive nose. Even when I'm not pregnant. I can remember disliking the one in my grandma’s bathroom when I was a kid. I bought fragrance-free or unscented personal products and cleaning products years before I ever heard the word "phthalates." When I got married, I had to wean my husband off of the spray air fresheners in the bathroom and the plug-in air fresheners throughout the house. I couldn’t stand the smell. And this was before I knew anything about toxins in household products. I’m not going to go into all the gory details about why you shouldn’t use most air fresheners. Let’s just say that they contain many chemicals (formaldehyde, petroleum distillates, p- dichlorobenzene, and aerosol propellants) that you and your children should not be inhaling or eating (the droplets linger in the air and fall on the floor). Believe it or not, the strong odor in your kitchen or bathroom will eventually dissipate. Lighting a match is our go-to bathroom deodorizer. Especially for my hall bathroom, which has no window (and kind of a lame fan). I always wet the match under the faucet for a second before tossing it in the trash. 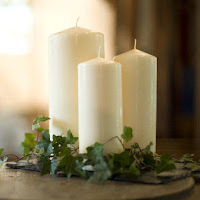 To take it to the next level, burn a soy or beeswax candle with natural fragrances. Just make sure you remember to blow it out later. We've used candles in the kitchen too. We love to clean the kitchen with vinegar. 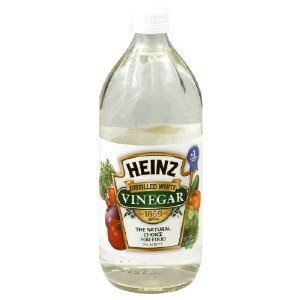 Vinegar has a very strong smell but it quickly fades and leaves behind a clean smell. 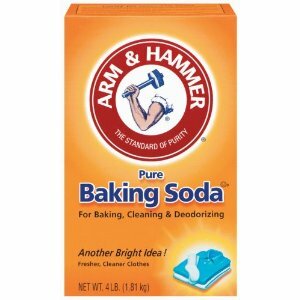 Great for kidding rid of food odors in the kitchen. My husband loves citrus. He usually eats at least one orange as well as a grapefruit every day. My baby and toddler love oranges and grapefruits too. My toddler loves fresh lemon juice on everything. So, we’ve got a lot of citrus action at our house. Citrus smells great. When your house stinks, peel an orange. A great trick for the kitchen is to put a few thin slices of lemon peel down the garbage disposal. Fills the kitchen with a lovely fresh citrus smell. Baking soda absorbs odor. I put some in my cloth diaper pail. Use it wherever you need to absorb yucky odors. I found these through my favorite cloth diapering store, Jillian’s Drawers. My husband said the urine smell in our bathroom (where the cloth diaper pail resides) was getting to be too much, and threatened to buy a synthetic air freshener to mask the smell. But this little citrus circle did the trick. One 70 cent circle keeps a nice citrus smell going for a couple of weeks or more depending on the size of the room. You could put it inside the pail – I just have it sitting on the ledge of the sink beneath the mirror. We use them in the car too. If you really want an air freshener you can spray, try essential oils. In a spray bottle, add several drops of your favorite scent and water. Shake and then spray. Boil a spice you love after cooking fish or other foods with lingering odors to get rid of that pungent smell. For more long-term issues, consider a fragrant plant, like Gardenias. Bar soap is great for small spaces, like an underwear drawer. After washing my hands in the kitchen or bathroom with our liquid hand soap, scented with essential oils, the whole room smells wonderful. There are also many natural alternatives to synthetic air fresheners you can buy in the store. I have hardwood floors and only washable carpets, so I have skirted the whole stinky carpet issue. But just for you readers, I conducted a cursory search for “natural carpet cleaner,” which turned up numerous products to eliminate pet and other odors without toxic chemicals. With so many affordable, easy and convenient alternatives, there is really no reason to expose your family to the toxic chemicals in synthetic air fresheners. Next time you find yourself sniffing something unpleasant, try one of these ideas instead! You've got me thinking...and I might try out a few of your suggestion. Love this! Thanks for all the ideas! I LOVE this list! I am always up for natural cleaners, sprays, etc. I make my own cleaners and use essential oils...I love them! Thank you Betsy for commenting on my blog for Top 1o Tuesdays! I hope you will become a follower of my blog and I am now your newest follower! Great ideas! Thanks for sharing with us! Have a nice day! Awesome list! I never buy sprays, etc bit haven't really been using anything as an alternative. I need to spruce up the smells in our house! Betsy, What a great blog you have! Thanks for sharing. (your #8 above) - I love to put some vanilla in water and boil it on very low heat on the stove top. Gets rid of smells in the kitchen and makes the kids and husband think there are cookies in the oven! These are wonderful ideas! We have quite a difference of opinion in our house - my husband may have taken stock in air fresheners, and it's maddening! Great tips! I love #9. I have a basil plant and it leaves such a fresh smell. Now to get the husband to stop using the nasty smelling spray on deodorant (Axe)that gives me a headache and makes me feel nauseous. Thank you for these tips! I love them! Please send them out to every Realtor!!! While trying to sell my house, my Realtor almost insisted on me using some fake smelling thing in my house. I have used only Shaklee products in my home for 30 years. When I refused he said well how about just getting some plug-ins and I will take them out after each person. I said NO! Doesn't anyone want a chemical free home? One that smells good and natural and not full of chemicals? I would think of that as a selling point!! Maybe we're not there yet.